Is Colleen Wolfe Lesbian ? The NFL anchor and reporter Colleen Wolfe is a household name in the media filed. She has worked for various media houses and has also produced shows like Phil's Postgame for PHL17 and the Golf Show. Wolfe was an anchor for CN8 and on-air-personality & producer for Comcast SportsNet Organizations. She came in the limelight after she was made the host of the National Football League Network. Colleen Wolfe was born on January 3, 1985, in Philadelphia, United States. Her father is a Flight Instructor while her mother is a homemaker. Their parents divorced later and began living their separate lives. As a child, Wolfe wanted to become a pilot like her father but the future had a different thing in store for her. She attended Drexel University where she graduated with a degree in Corporate Communications. After her graduation, she started working in the media field. 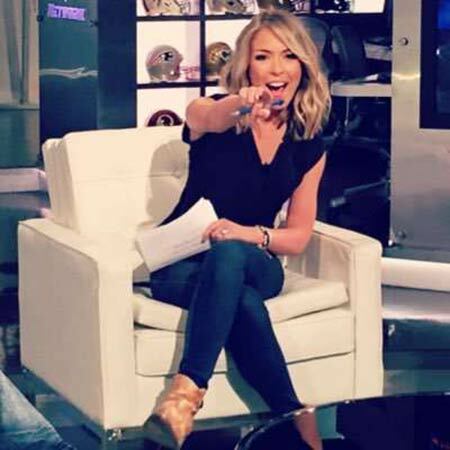 Colleen Wolfe is professionally a reporter and anchor who hosts Thursday night football and Good Morning Football Weekend. Wolfe started her career as a reporter for the sports radio station called WIP where she handled the morning shows. While her time there she also did editing, producing and was an analyst. Later on, she began working as an anchor for CN8 and on-air-personality & producer for Comcast SportsNet Organizations. It was in 2012 when she was chosen as a sports reporter for FOX 29 in Philadelphia. Besides she has produced shows like Phil's postgame for PHL17 and the Golf show which was aired on the CSN Channel. She came in the limelight after she was made the host of the National Football League Network. Colleen Wolfe's net worth is not estimated and is still under review. Her main source of earning is from her career as a media person. However, some sources claim her net worth to be $500,000. Colleen Wolfe is a married woman who tied the knot to a sports presenter named John Gonzalez. He presents the 97.5 talk show for the Inquirer Sports Person. The couple got married in May 2010 and are happily living together to date. Since they pursue the same career they are very compatible and this might be the reason for their strong marriage. The couple doesn't share any children together as of now and both of them are focused on their career. Wolfe pets a cat named Ernest Hemingway and a dog named Blitzen. She is interested in figure skating and does it often. Her other hobbies are fishing and listening to music. She is pretty active in her social media handles and has around 35.2k and 60.7k followers on Instagram and Twitter respectively. Wolfe is an attractive woman with a good physique. Here is a video of Colleen Wolfe discussing things on her Dear Diary With Colleen Wolfe. Colleen Wolfe is married to a reporter named John Gonzalez and they had tied the knot in May 2010.